ETFGI reported that Environmental, Social, and Governance (ESG) ETFs and ETPs listed globally gathered net inflows of US$679 million during December. Total assets invested ESG ETFs and ETPs decreased by 3.20% from US$23.22 billion at the end of November, to US$22.47 billion, according to ETFGI’s December 2018 ETF and ETP ESG industry landscape insights report, an annual paid-for research subscription service. At the end of December 2018, there were 208 ESG classified ETFs/ETPs, with 492 listings, assets of $22.47 Bn, from 61 providers listed on 26 exchanges in 23 countries. Following net inflows of $679 Mn and market moves during the month, assets invested in ESG ETFs/ETPs listed globally decreased 3.20%, from $23.22 Bn at the end of November 2018, to $22.47 Bn. 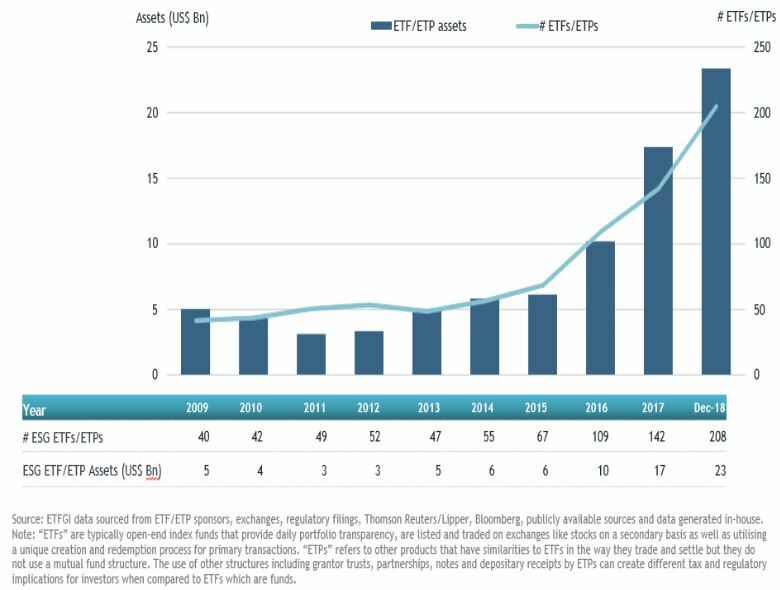 Since the launch of the first ESG ETF/ETP in 2002, the iShares MSCI USA ESG Select ETF, the number and diversity of products has increased steadily, with 208 ESG ETFs/ETPs listed globally at the end of 2018. 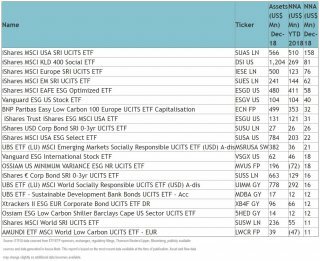 70 new ESG ETFs/ETPs have launched by 27 providers during 2018, with 4 during December alone. 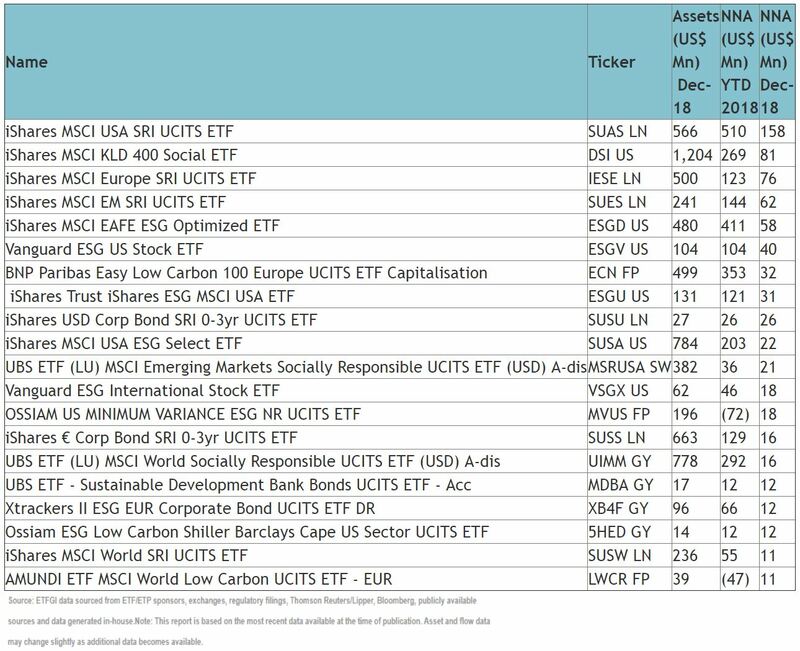 Substantial inflows during December can be attributed to the top 20 ESG ETFs/ETPs by net new assets, which collectively gathered $732 Mn during December. The iShares MSCI USA SRI UCITS ETF (SUAS LN) gathered $158 Mn, the largest net inflow in December. Confusion persists around what constitutes an ESG fund. According to PRI, a UN-supported initiative which seeks to understand the investment implications of ESG issues, 56% of adopters believe there is a lack of clarity in ESG definitions. ETFGI’s classification system attempts to provide greater precision, with ETFs/ETPs listed globally organised into categories, including core ESG products and theme-based groups, such as Clean/Alternative Energies and Gender Diversity.